When “Pretty Little Liars” star Tyler Blackburn purchased his first home, in Los Angeles’ hip Los Feliz neighborhood, he knew he wanted to make some changes to create a space that would truly feel like his own. One of the actor’s favorite aspects of the renovation is the new and improved backyard, finished just in time for his big 30th birthday party. Here’s a look at three updates he made to achieve his dream backyard. Where there used to be an expansive slab of concrete, Tyler put in a large pool and hot tub. 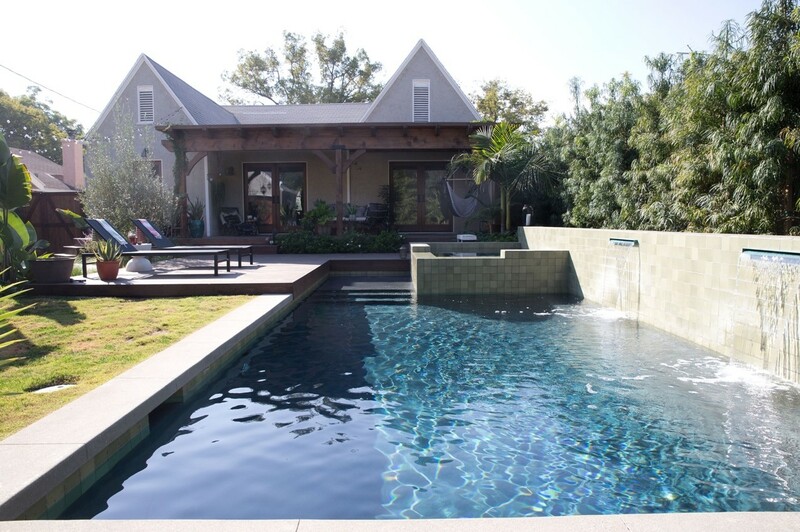 Complete with water features, the pool and hot tub’s design makes it easy to slip from one into the other – the ideal combination for a cool evening in L.A.
To escape the not-so-cool Southern California sun, Tyler built a pergola off the back of his house. Under its shelter, he placed a patio sofa, hammock chairs, and a natural wood coffee table where he can enjoy his morning coffee with his cute pup, Dylan. Not wanting to leave Dylan out, Tyler dedicated a large portion of the previously grass-less yard to a grass patch for her to romp around on. To celebrate finishing his dream backyard, Tyler hosted his friends and family for his 30th birthday. The party was made extra special by the presence of his grandparents, who Tyler lived with as a young child. Sometimes all you need for the perfect milestone birthday is good food, the people you love, and your own backyard.